They ruled our roads a century ago, they rule them still. 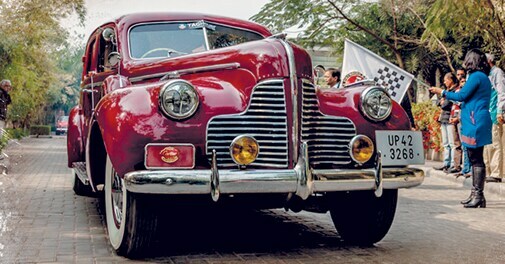 A look at some of India's oldest automobiles and the men who keep them roaring. It was on a sunny January morning that the Vivanta at Taj-Surajkund was transported back in time to the early 20th century. Instead of the gaggle of tourists you usually find lounging around five-star hotels in Delhi, what caught the eye on its sprawling grounds were rows of colourful vintage cars of all shapes and sizes. Be it the Tin Lizzie (the Ford Model T), which brought personal conveyance to the middle class American's doorstep in 1909, or the Rolls Royce K-Series, which transported Maharajas across the expanse of pre-Independence India in the 1920s, every four-wheeler that ever made its presence felt in the history of the automobile industry was in attendance at the vintage car show. Even as the organisers led the crowd of onlookers from vehicle to vehicle, a few among them could be seen checking the vintage beauties on their own - eyes wandering over their beautiful leather upholstered interiors and letting their fingers run flirtatiously over polished curves that belonged to an automobile generation from aeons ago. As for the owners, you could see their faces glowing with pride as they described their cars to the fawning public. Love was in the air that day. Quite understandably too, because unlike the short-lived joy of buying the latest sports car, the feeling you get from taking in a vintage automobile is akin to expanding your family to accommodate a new member. Most of them have been picked up from scrapyards and painstakingly resurrected to their former glory over a span of many years, and parting with them could feel like bidding farewell to an adopted child. Madan Mohanâ€™s vintage car collection is the realisation of a childhood dream. This was something that SB Jatti, vice president of the Heritage Motoring Club of India (HMCI), noticed firsthand when he got himself a 1954 Fiat Millecento. "It's my oldest car," he says, "I found it in one of the workshops at Chittranjan Park about 20 years ago. The vehicle was in a bad state, but the owner - who had it in his possession for thirty years - was very reluctant to sell it. It took three long years to make him sell it, and he did it with tears in his eyes." As it turned out, the Millecento's journey to restoration was quite a bumpy ride. "I had to restore the car personally over the years, and the parts were sourced from all over the world. Though this is an Italian car, no parts are available there - for some strange reason," says 55-year-old Jatti, adding that it takes nothing but pure obsession to rebuild a vintage car from near-scratch. Today, he owns four such vehicles, including a 1964 Ford Mustang and a 1976 Fiat X1-9 Bertone. 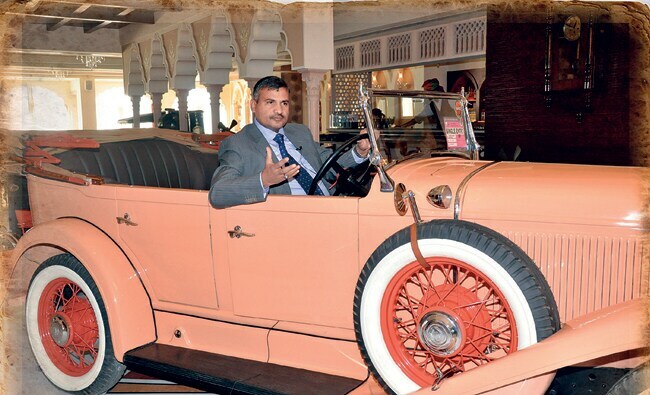 Diljeet Titus with his 1930 Stutz, the only car of its kind in India. For Madan Mohan, one of the senior members of the motoring club, the dream took root when he was just eleven years of age. "Back then, I used to wait long hours for the Maharaja of Khetri, Rajasthan, to drive out of his palace because I was singularly fascinated by the beauty of his car. As time passed, this fascination turned into passion, and imagine my joy when I finally got to buy a Dodge 6-1929 - the same car as the Maharaja's - in 2000!" When it comes to maintaining his vintage cars, Mohan leaves no bolt unturned. "We have a 47-strong team of repairmen to restore and maintain our cars. While there are times that liberties are taken with colour, we do not compromise on spare parts. They are 100 per cent original, and usually imported from other countries," he says. 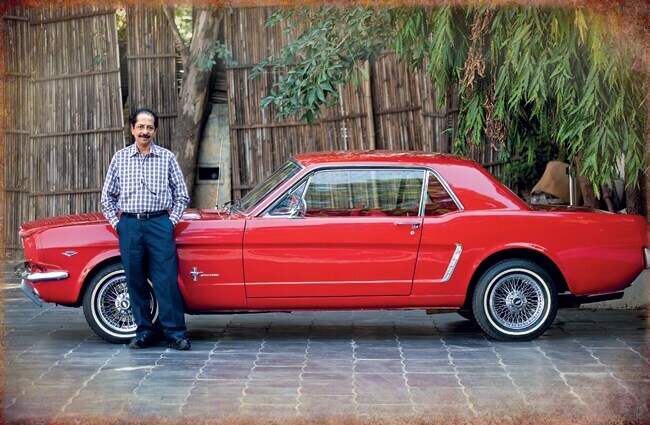 SB Jatti and his 1964 Ford Mustang are virtually inseparable. 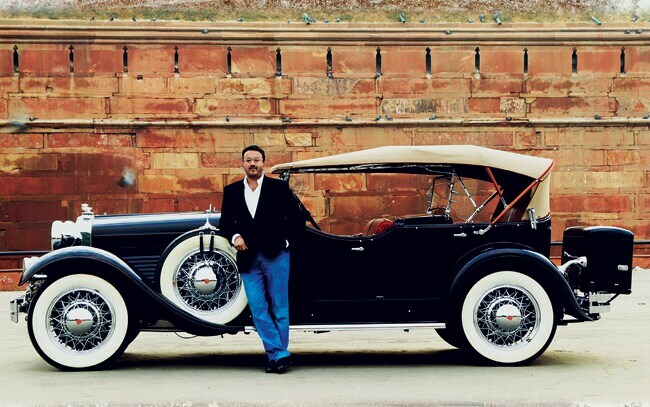 A majority of the vintage cars in India have their roots in royalty. A case in point is the 1927 Rolls Royce (Series K) Barker Tourer that Diljeet Titus, founder of the Titus & Co Museum of Classic Cars, "inherited" from the Nawab of Sachin, Maharashtra. Titus' passion for automobiles was kindled at a very young age, and it never really went away. "My mother says that as a boy of five, I used to plant little toy automobiles in our garden - hoping that they would yield trees full of cars. While that fantasy never materialised, I started collecting cars in 1999. By 2003, I had set up The Titus & Co. Museum for Vintage & Classic Cars." Today, at 48, he owns 72 classics, including Packards, Cadillacs, Buicks, Chevrolets, Dodges, a Pierce Arrow, a Willys Knight, an Auburn Boat-tail Speedster, two Rolls Royces, two Mercedes, the extremely rare Minerva Type AL, and the only Stutz in India. What are the precautions one should take while handling these beauties from the past? "Rust is a vintage car's biggest enemy," says Jatti. "It should be cleaned everyday with a moist cloth after the dust is removed with a feather brush." He believes that with the exception of additions like electric fans to prevent radiator overheating, one shouldn't tamper with the "originality of the vehicles". The vice-president of the HMCI, however, expects more help from the administration as far as preserving vintage cars is concerned. "The government should encourage the preservation of such priceless pieces of heritage. Special registration numbers should be allotted to heritage vehicles, and regulations on fitness must be waived off. Also, comprehensive insurance and duty-free import of parts should be made available," says Jatti. One look at his gleaming Mustang, and you see his point. These glorious metal monsters have come a long and bumpy way, it's only fair that we smoothen their road ahead.